That you’re with me on this journey? Means so much. You’ve been with me since the beginning. And with regard to your Love Idol, I am nodding my head. So much yes and amen here. And you know how I feel about all this, about you, about everything. And you know how much I love you. And you get to keep your tea! I’ve had some of these very same thoughts, lately, Megan. I keep thinking of that old Hayley Mills movie (or, if you prefer, Lindsey Lohan) The Parent Trap. I’ve been caught in “The Parenting Trap”. And I thought it would get easier. Somewhere, someone is laughing maniacally :). Love to you as you enter in to Lent. aahh parenting, i use to be the proud momma of a compliant teen daughter, she made me look good, like I had my act of Christian parenting together. And then she turned 19, it shook me off my axis and i had to realize that her choices are not a reflection of my parenting, or how much I love her, or how i disciplined her. 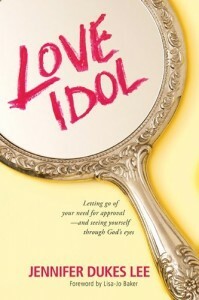 This is my daughter’s story, her love idol, her journey to the cross and I can’t jump in between and rescue her from it. And then I had three more daughter’s which ive learned there are no rules, you just hold on, give grace and pray as if your life depends on it. It all works out for His glory and not our own. so glad to be with you learning to break through our idols knowing that in Christ we are already preapproved. So much truth here, Megan. I am so hard on myself as a parent. As a person, really. I never considered that parenting could be a love idol, but yes, I see it’s true. For me, too. Wow, Megan. I get this one. I really do. ANYTHING can become a trap, an idol, a major distraction from our focus on letting God live through and change us. Praying for you as you move into and through this transition time. Megan, you nailed it here. Wow. This journey is well timed for many of us, thanks for sharing yours.